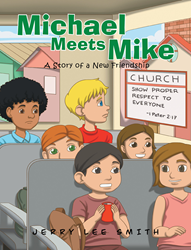 Recent release “Michael Meets Mike: A Story of a New Friendship” from Page Publishing author Jerry Lee Smith is the story of Michael’s first day at a newly desegregated school. He takes a seat next to Mike, who soon realizes that other than their different skin color, he and Michael have a lot in common and would become great friends. Jerry Lee Smith, a retired school principal living in his native North Carolina, has completed his book “Michael Meets Mike: A Story of a New Friendship”: a charming tale of open minds and new friends for grade-school readers. In “Michael Meets Mike”, Michael is excited but nervous to start his first day of third grade in a new school located across town. On the bus ride to school, Michael sits next to another boy, Mike, and finds out how differently people view each other from the outside. Even before the boys arrive at school, they discover the value of friendship just by talking and learning about each other. Set in the 1970s, Michael Meets Mike illustrates the beginning of a friendship amidst the hard transition to racial equality in a local school. Published by New York City-based Page Publishing, Jerry Lee Smith’s book reinforces important lessons in social justice, friendship, and tolerance. Readers who wish to experience this instructive work can purchase “Michael Meets Mike: A Story of a New Friendship” at bookstores everywhere, or online at the Apple iTunes store, Amazon, Google Play, or Barnes and Noble.